I'm known for coming up with creative and personal gifts at each holiday. This is a task that does not come easy as I spend countless hours researching and trying to think of ideas that will really touch the receiver's heart. I have been successful for many years and I will provide tips and ideas on-going but wanted to provide my insight in a product that I absolutely love and so do others. Kodak Galleries has the best personalized photo ideas around. 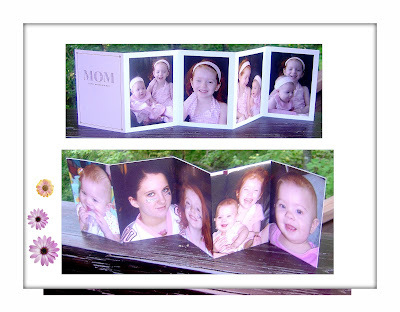 Last year, I utilized the accordion style photo cards to give to family members at Mother's Day, Father's Day and a "just because." When my littlest one was hospitalized, I brought in a few of the copies I kept so she could see her sisters and the nurses raved about how great they were and wanted to get them too. You pick the photos to upload, place them where you want, choose from many styles and Kodak will even ship them directly to the recipient. Kodak has also reduced their shipping charges which is another bonus. Don't forget to always search for coupons online before buying as you can save a lot of money. When you join Kodak now, they are offering a special of 75 free prints and free shipping.